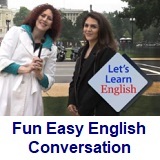 ﻿ Fun Easy English - new american english standard conversation Voice of America VOA learning English for beginners lesson 12 Meet My Family discourse. In this lesson Anna is feeling homesick. Marsha helps her by listening to her talk about her family. 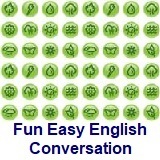 In this video, learn to say the new words. 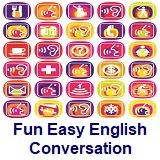 Learn to ask a friend to talk about a problem. In this video, you ​learn about how Americans pronounce the word "aunt" in different parts of the country. Are you from a big family or a small family? Write about two people in your family. What do they do? What do they make? Write about them in the Facebook Comments section below. Then practice with a friend. 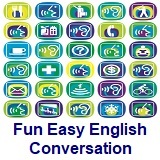 Click lesson activity to get the printable PDF version. The page opens to a new window.